Louisiana literacy test update: The hunt for the original document. 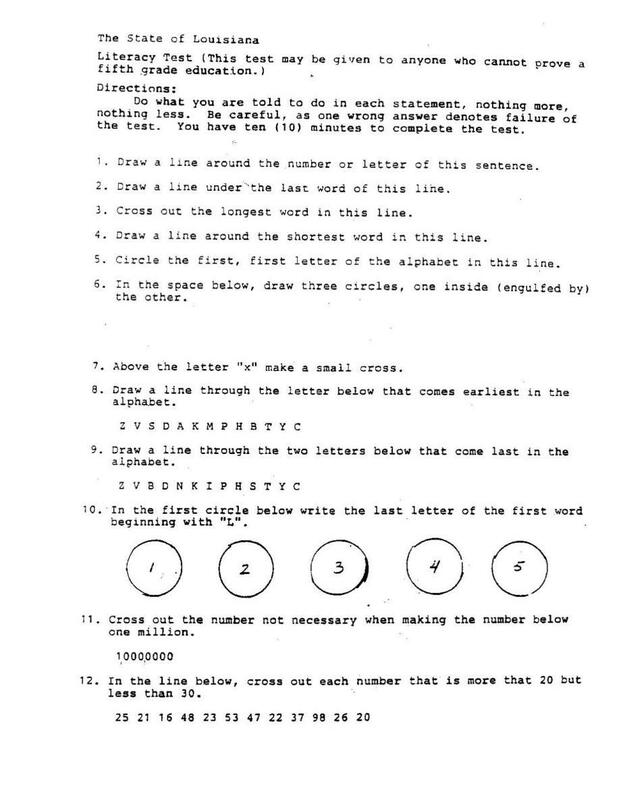 Last week, I posted about a bizarre and unfair literacy test used as a barrier to prospective black voters in Louisiana in 1964. Since then, several readers have contacted me wanting to know more about the test’s provenance. Here’s an update on my search for an original copy. He pointed me to this blog post about his experiences working in Louisiana, which included reflections on the way that two of the questions on the test could have been differently interpreted by a registrar inclined to block a prospective African-American voter from the franchise. After reading my original post, two history professors from Louisiana Tech, Drew McKevitt and David Anderson, pointed me to a Louisiana District Court decision from November 1963 (PDF), which ruled that tests based on interpretations of the Constitution (such as the 1963 version of the Louisiana test also posted on the CRMV site [PDF]) were unfair and unconstitutional. This might provide a historical explanation for the existence of the test I posted, which uses questions of the “brain-teaser” type rather than trivia about civics and the Constitution—a significant departure from previous practice. I am still in the process of contacting archives in Louisiana, historians who work on civil rights, and oral history collections that contain reminiscences of civil rights workers and prospective voters from the time period to see if I can get any closer to an original copy of the test. I am also hoping to learn more about the way the test was made: Could it have been adapted from an Army intelligence test from WWI, as one commenter on the original post posited? Or was it derived from another kind of IQ test? I will update as I find out more. If you have any further leads, please be in touch. From Cher McDonald’s AP US History website.